We woke this morning to the sound of raindrops pounding the roof and splashing the windows. So hard to accept after the lovely sunny and warm weekend. Yesterday we were at the beach and there were kids in their skivvys playing in the sand and dipping their tiny toes in the Sound. We slathered on sunscreen and sat in the sand eating pizza and drinking beer out of plastic cups (and talked about how summer had arrived). And today we woke to rain. Really? On day one of Bike to School Month? Can’t we catch a break? I was ready to ditch the bike-to-school-plan and walk instead. (We only live 5 blocks from school, it’s easier to walk). But we _are_ the organizers and during Bike to School month, we ride. Plus my second grader was NOT going to let me wimp out this morning! I was already making excuses as we packed lunches and finished breakfast. 2nd grader: Do we need rain pants, mom? 2nd grader: Will you find my rain pants, mom? Me (to myself): he’s not going to let me out of this, is he? Alright, rain pants and rain jackets and seat covers it is, let’s get going or we’re going to be late. And so the month begins. The kids keep us honest and don’t let us make excuses. And we ride bikes in the rain and we smile and laugh. We get a little wet, but it’s only rain, we can handle that. Editorial note: Unfortunately for some reason this post is attracting an avalanche of spam comments. So we are turning off comments on this post and all old posts for the time being. Because our stuff isn’t always time sensitive, we actually like having discussion available on older posts. Hopefully the spammers will move on to someone else (or that the WordPress spam filter will catch up to their evil ways) and we can turn restore the comment feature on older posts real soon. This entry was posted in alternative transportation, bikes, kids, School, weather and tagged 2011, bike-to-school, kids, May, rain, School, seattle, weather. Bookmark the permalink. So sweet. What a good boy! I rode too. 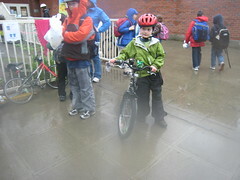 We rode, but didn’t realize there was a bike to school month! Great story… Good for ya’ll. My son is grown now but I did all my running around town on my bike today. This included bringing home 3 steel storage cabinets and shelf unit by bike. Keep up the good posts. Good for your son and you! My older daughter, now 12, is less enthusiastic about riding to school than when she was younger. Part of the reason is that she has outgrown her old bike, and we have yet to replace it with one that is suitable (soon, soon). Fortunately, her younger siblings (in 2nd grade too!) have picked up the slack and want to ride even in the pouring rain!